The Causeway Coast Way starts (or finishes) at 'The Diamond' in the heart of Ballycastle. The Way follows the main shopping thoroughfare for nearly 1km down to the seafront. Upon arriving at the seafront, a fantastic vista opens up with views to the east across Ballycastle Strand to Fair Head and beyond to the Mull of Kintyre in Scotland. To the immediate north are the recognisable white cliffs of Rathlin Island. The trail turns left and starts the steep climb up North Street, passing a right turn for the main harbour area. Those wishing to explore the nature reserves of Rathlin Island can catch the ferry from terminal down from this turn-off. On the ascent of North Street, just before reaching a bend to the left, is a memorial stone to Marconi. He carried out his first radio transmission tests in 1898 from Ballycastle to Rathlin Island. Once the road has passed the Silver Cliffs Caravan Park and Hayes Caravan Park, the climb starts to level a little and the trail leaves the main road to the right and down a small lane. Soon the lane arrives at a T-junction and turns left into the Carnduff Estate. Shortly afterwards it reaches the main Coast Road and turns right. Care must be taken when walking along this road as there are no footpaths. Walk on the same side of the road as approaching cars and always opt to walk on the outside of the bend regardless of which side of the road it is on. A little over 1km along this road is a turn-off to the right for Kinbane Head. A worthwhile detour of 3km in total will take in the magnificent chalk cliffs and ruins of Kinbane Castle. Back on the main road, it takes another 1km to reach Glenmore which is just past a sharp right bend in the road. There is a restaurant and bar here to provide a well-deserved break. A further ½km of trail reaches a right turn off the main road. The trail then follows a minor road as it dips through some surrounding fields of sheep before rejoining the main Coast Road within 1km. Turning right, the road continues to rise for ¾km to the large car park at Portaneevey. A slight detour towards the cliffs within the car park will provide a great vantage point to view Rathlin Island and the Carrick-a-Rede Rope Bridge through a telescope. Shortly after Portaneevey, the road begins to descend towards Ballintoy, providing great views towards it's iconic whitewashed church and the headlands of Bengore Head in the distance. 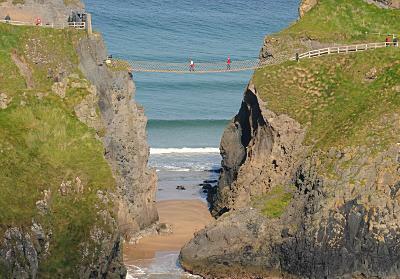 Within 2km, the Causeway Coast Way turns right from the main road and down towards Larrybane and Carrick-a-Rede. After 300m, beside the Weighbridge Tearooms, there is the option to continue on to cross the Rope Bridge through the paypoint kiosk. Otherwise the trail continues on above the chalk quarry of Larrybane and follows the cliffs of Boheeshane Bay, before finally reaching Ballintoy Parish Church after 1½km from the Tearooms. Accommodation for the night can be found in Ballintoy village which is up the hill to the left and taking another left at the main road. The Causeway Coast Way continues to the right, heading down the hill for Ballintoy Harbour.